I come to a doorway. It is wooden, and hand-carved with stars and suns that remind me of my place on earth. I pass through this threshold, and I enter another time, another place, another way. I see tanned, wrinkled hands painting a yellow flower on a white-washed, masonry stove. Red geraniums brighten a window sill. Streams of sunlight shine through an intricately cut paper curtain. Under a thatched roof, atop a high bed, stitch by stitch, a dream garden sprouts to fertile life: hand-embroidered fruits and flowers populate plump, homespun pillows and feather quilts. A kitchen garden pulses with life just beyond the cottage window: rosemary, roses, sunflowers, nasturtium and dill. I share a simple life, hard work and gratitude. We thank the creator for the cycle. We acknowledge deep mysteries and pass them on through simple symbols. We work with our hands in paper cutouts and wood carving, bright paint and embroidery: birth, life, death. The sacred and the everyday walk hand and hand. The toil on the land touches the spirits of the sky. I've entered the place where my ancestors' souls reside. My roots have reached and pull me here. My Slavic soul has returned home. My babci, Stella, was born southeast of Krakow, Poland where she lived for the first thirteen years of her life. My grandfather, George, Stella’s husband, was born in Hungary and moved to the US soon after his birth. Stella and George met as young adults on the dance floor in Philadelphia, and they danced all their lives, especially to polka. The smells and tastes of kielbasa, pierogi and bejgli, Hungarian nut and poppy seed roll, are all part of my memory of their home. In the summer of 2011 I had the opportunity to travel to Poland and Hungary to visit the places where my ancestors resided and my relatives still live. While there, I studied and appreciated the traditional arts. My work celebrates my time there, the fruits of a personally inspiring quest. I now make my home in the hills of western Massachusetts with my husband and two young children. I make my art there, teach art workshops and moonlight as a singer with Radio Free Earth and various other projects. 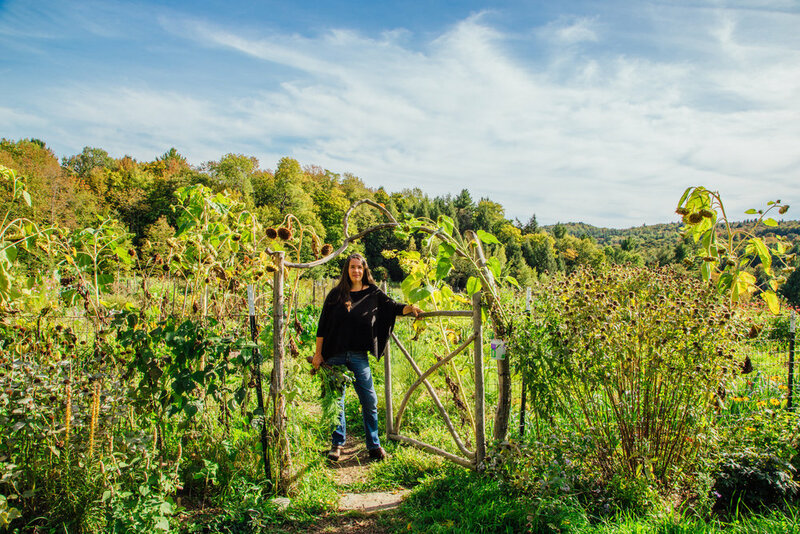 We live on 10 acres of mostly wooded land with a patch of sunlight around the house big enough for our flower, herb, fruit and vegetable gardens. I create art in my home studio and rest my eyes while looking out a big window towards the horizon, “where earth meets sky.” And I dream of returning someday to Poland and Hungary, with my family, to renew connections with family and friends there, and to continue my studies of the rich tradition of my ancestors.